Host® Sponges Cleaner is a soft, absorbent, natural product that is environmentally friendly. The sponges are moistened with water, detergent and a small amount of safe-to-use solvent. 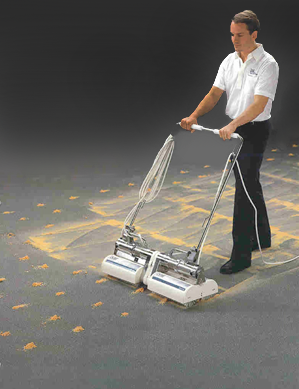 Using a Host® Machine, we simply brush the Host® Sponges Cleaner down, over and through the carpet fibers. The Host® Sponges Cleaner dissolves, absorbs and traps soil, spots, strains and odors as it cleans. Just as a sponge in your kitchen holds onto dirt, the Host® Sponges hold dirt and are removed by vacuuming. Carpet is left clean, dry and ready to use and enjoy right away! Why should your carpet be cleaned with Host®? Host® protects and prolongs the life of the carpet. Carpeting can hide dust mites, bacteria, and dirt deep in its fiber. Though it may not appear dirty on the surface, it is still important to clean your carpeting regularly to improve the health of your home and the longevity of your carpet. Oil deposits from foot traffic creates a residue on the carpet fibers. Soil and dirt stick to the residue and can build up over time. By choosing the Host Cleaning Solution, the build up is thoroughly extracted, improving the look, health, and lifespan of your carpeting. • Host® deep cleans even the dirtiest carpet while deodorizing and leaving a fresh, clean, scent. • Host® will not damage carpet, padding, or subfloors. • Host® leaves no detergent residue so your carpets so it will not re-soil quickly. • No residue, which means spots and stains won't return.